Tonight we’re in Padstow, Cornwall. Today was quite active, and I’m glad to be “home”. Our hotel room, while not nearly as nice as the place last night, is overlooking the harbor from the “Custom House”. Seagulls, boats, restaurants, swans, etc. Church bells through the window sound nice. This morning we had an excellent breakfast alone in a sunroom. Muselix, eggs, bacon, sausage, toast, etc. (After a few games of snooker in the parlor.) Unfortunately it started to drizzle, so we drove down the lane to the sea rather than walking. Then it was off into Devon and Cornwall. 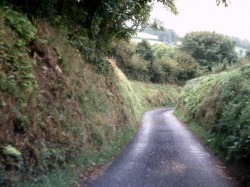 First, we drove on some minor roads through Exmoor. Cloudy and drizzling slightly, which added to the mood. Not as wild as I expected, though. 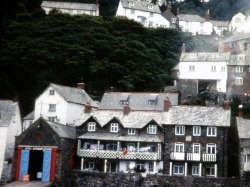 Then up to Clovelly, where we climbed down into the town via hundreds of stone steps. A bizarre town, and I can’t imagine who would want to live here, what with all the steps and tourists. A pretty unusual town, though. We followed up those steps with yet another strenuous walk – to “King Arthur’s” castle at Tintangel. The “castle” itself is in total ruins, but the views were spectacular. (Ed Note: On a bluff 100’ over the water.) We were so tired by this time, we paid 40p each for a Land Rover ride up the hill back to town. In town, we also saw a 14th c. post office! Then back to Padstow where we found this hotel. Since we are halfway through the trip, we sat down and planned the rest of it. How time flies – it looks like we won’t be able to do all we wanted. But tomorrow a.m. we will call the hotels for the next 5 nights, so Jill won’t be so panicked when 5:00 rolls around. Plus, we’ll have a better idea of what we want to do each day. For lunch today we stopped in Bude and bough ½ lb. of aged English cheddar for sandwiches, from a dotty old bat. Also bought 1 liter of “Scrumpy”, an alcoholic cider I am drinking now. Interesting, but an aftertaste I don’t like too much. Last night’s dinner was exquisite. I had cold tomato-orange soup – great. Jill’s cheddar soufflé was delicious, as were our main courses of lamb with blackcurrant sauce and filet of brill wit cream sauce and shrimp. Then fresh kiwis with kiwi sorbet, and wild apricots in brandy with ice cream. But wait, there’s more – a cheeseboard, Grand Marnier, and coffee! Talked with a couple from St. Louis who we later met in Clovelly. He once tried to do a deal with Hanson, and knew all about the company.